The rule which says that two is always better than one could be applied in many life situations. This time I am talking about anchoring. There are several anchoring techniques which require two anchors. Most of them consider each anchor to be equipped with its own chain or anchor line. I would like to share with you the innovative system of anchoring two anchors using single anchor chain. Tandem Anchor System® should solve the eternal problem of placing two anchors on one anchor chain. The system consists of two plough anchors among which the waist of the smaller anchor is being prowled into the waist of the bigger one. Folded one inside the other they have the same dimensions as classic anchor of the same mass. When anchoring Tandem Anchor System®, first anchor is being dropped exactly in the same manner as any other anchor. As the first anchor is dropping, the anchor chain floats through the second anchor. After few meters it is time to attach second anchor to the chain – by a simple attachment break. When both anchors touch sea bottom it is time to stretch the chain and finish the anchoring maneuver. The use of Tandem Anchor System® provides incredibly high holding power and significantly increases safety at anchor guaranteeing carefree sleep. Hoisting the anchors will not be a problem at all. When the second anchor, first to come out of the water; is at its place on the deck, you can easily detach it off the chain and continue with hoisting the rest of the chain. Second anchor fits back into its place in the waist of the previous anchor and the maneuver is done. Tandem Anchor System® was presented by Slovenian Weber Marine Ltd., sailboat and powerboat accessories supplier of marine hardware and electronics under Wemar trademark. 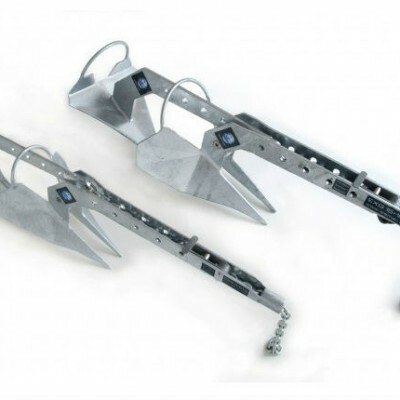 Their patented Tandem Anchor System® was nominated for DAME award in 2012. Although they didn’t win the prestigious award, this innovative system became highly appreciated by numerous nautical enthusiasts and professionals.